Look at these lovely pieces and then show them some LOVE. Oct 26, 2018 Halloween Party at the YMCA! Aug 23, 2018 These Guys are OPEN for business!!!! Aug 5, 2018 These Guys are OPEN for business!!!! Feb 1, 2018 New year,New TMNT! Oct 26, 2017 I need your help! Oct 15, 2017 bucket list: for Adulting! I am always on the constant and persistent journey to become a better artist!!!... and yadda, yadda have my own show one-day yadda(or make a webcomic, that'd be cool too). 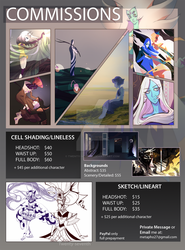 Also if you want to help me out I am open to taking commissions! Favorite movies Kung Fu Hustle, Brave, Mommy Dearest, Chicago, The Lion King, The Sea Prince and the Fire Child Favorite TV shows Archer,SVTFOE, The Disastrous Life of Saiki K,HXH, Miraclous Ladybug,Deadly Women, Snapped, American Dad, The Simpsons, The Tudors, Favorite bands / musical artists SWV, PhemieC,Nick Leng, TODRICK HALL, Haley Reinhart, Melinda Doolittle, Carol Emerald, Ashe, MisterWives, Orphan Mothers, Shoos Off Favorite books Island of the Aunts, Percy Jackson series, Fire and Ice series, The Giver, 1984, Bodega Dreams, the ones who walk away from omelas Favorite writers Ellen Hopkins and Rick Riordan Favorite games Bayonetta 1/2, Shadow of the Damned, Dynasty Warriors series(except 6 and 9), SW, Tales of Symphonia/Abyss/Vesperia, and best fiends Other Interests Writing and developing my stories, helping stray cats, talking to people, thinking about my story and characters, critiquing shows and comics I like, researching about characters, and messing with my sister. Thanks so much for faving Conspirator Couples 2.0~! Thanks so much for faving Determined Lily~!